On January 16, 2018, California Dairies, Inc. (CDI) announced it will cease operations at the Los Banos, California, manufacturing facility on March 17, 2018. The entire facility will close, affecting approximately 63 employees. In conjunction with the closure, CDI will exit the cream cheese and Neufchatel business, which was served solely by the Los Banos facility. CDI will continue to operate its five other manufacturing facilities and no other product segments will be affected. The Los Banos facility will ramp down operations over a 60-day period. CDI will be working closely with impacted employees to assist them and their families with this transition. CDI will also work with existing customers to enable a smooth transition in the areas of finished goods supply, packaging inventories and, where feasible, forward pack of finished goods. 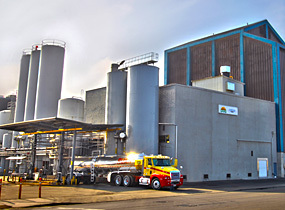 The Los Banos manufacturing facility has been in operation since 1925, where it was first operated as part of San Joaquin Valley Dairymen, before merging with Danish Creamery and California Milk Producers in 1999 to become California Dairies, Inc. CDI continues to have a significant presence not only in California, but also throughout the United States and globally.